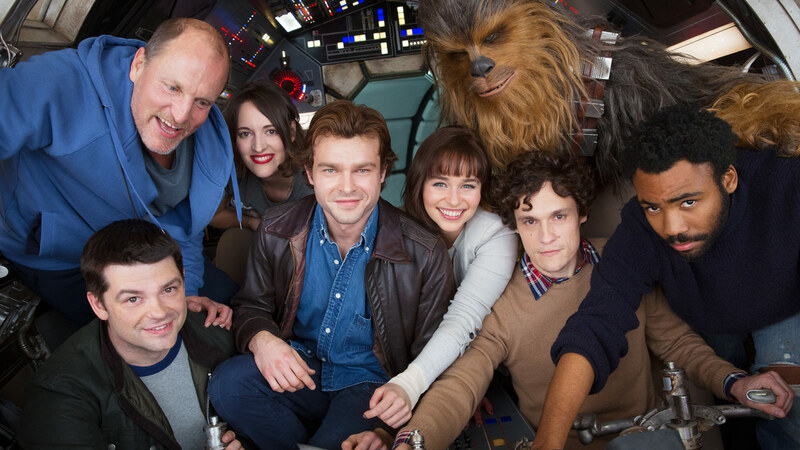 Filming For The Han Solo Origin Movie has Begun! StarWars.com is reporting that filming for the new Han Solo Star Wars movie has begun! The yet untitled Star Wars Story (stand alone movie) will focus on the pre-New Hope adventures of everybody’s favorite scruffy looking Nerf herder, Han Solo, his trusty sidekick Chewbacca and Sabacc card playing buddy Lando Calrissian. As we know from dialogue in Empire Strikes Back, Solo won the Millennium Falcon from Lando in a game of Sabacc (similar to poker) sometime prior to A New Hope. I do not know if that scene will make the movie or not, but that would be awesome! Playing the young scoundrel will be Alden Ehrenreich who was recently seen as Hobie Doyle in “Hail Caesar!” and playing Lando Calrissian is Donald Glover, who was excellent in the TV show Community. Woody Harrelson, Thandie Newton and Emilia Clarke will also be in the movie with Joonas Suotamo returning to play Chewbacca, whom he played in Force Awakens. I am most excited that Lawrence Kasdan will be returning to the Star Wars universe to write the screenplay. He has previously worked on the screenplays for Empire Strikes Back, Return Of The Jedi and The Force Awakens. I truly believe that the absence of his writing talent was painfully transparent in the dialogue on the prequels. As of now, Han Solo A Star Wars Story is scheduled for release May 25th, 2018. Side Note: In the old expanded universe (which is no longer canon) Han Solo’s origin was covered in the Han Solo trilogy by A.C. Crispin. In these books, Han’s origin parallels Oliver Twist initially and his girlfriend prior to A New Hope, Bria Tharen, led the rebel raid that acquired the plans for the Death Star. The novels are still a good read today. Next Do You Want To Own A Piece Of Limp Bizkit & Sega Dreamcast History!